In August 1872, photographer Henry Beaufoy Merlin and his young assistant Charles Bayliss arrived in Gulgong and in less than two months they had photographed buildings, street scenes, panoramic views and the people of the rapidly growing town and its surrounds. After Merlin died the collection, amounting to around five hundred glass plate negatives, was purchased by the wealthy Hill End miner Bernard Otto Holtermann. These he added to his collection of commissioned photographs by Merlin and Bayliss. Fortunately the Gulgong plates survived and are now part of the renowned Holtermann collection which are housed in the State Library of NSW and recently inscribed on the UNESCO Australian Memory of the World Register. A number of buildings photographed by Merlin can still be seen in Gulgong. 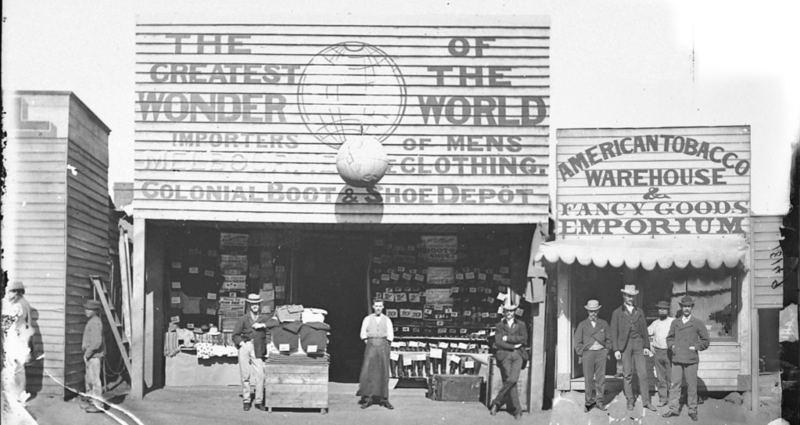 Two classics are THE GREATEST WONDER OF THE WORLD and THE AMERICAN TOBACCO WAREHOUSE & FANCY GOODS EMPORIUM, both stand proudly side by side in Mayne Street. Restored in the 1970’s they unfortunately over the years, fell into a poor state of repair. However, a number of locals made the decision to form an Incorporated Association to work towards ensuring the survival of these two buildings. The intention was to continue their use as viable commercial entities, whilst also making a significant contribution to Gulgong’s tourism appeal and their value as a unique educational resource. At this point, the obvious step was to approach the NSW State Library and negotiate the possibility of a permanent display of the Holtermann photographs, and in so doing marry the photos and the two original buildings used in the 2013 exhibition ‘The Greatest Wonder of the World’. These negotiations were very positive and resulted in the donation of a substantial exhibit by the State Library for permanent display. Copyright © 2019 Gulgong Holtermann Museum. Powered by WordPress and Stargazer.